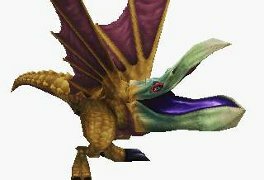 Description: Easily identified by its band of colored plumage, which rivals that of even the most exotic jungle fowl, this creature makes its home in the sun-baked desert climes of Ivalice. Adventurers be warned, its cheerfully colorful appearance belies a violent nature, and its beak is as sharp as the weapon after which it is named. Generally feeding upon smaller creatures, they have also been known to gather in packs for the hunting of larger prey.